Kelleher Auktionen: Kelleher 720. Auktion Auktion ist bereits beendet! U.S., Tidy Powerful Plate Block Collection, 1901-20s (Scott 296//Q5 about). 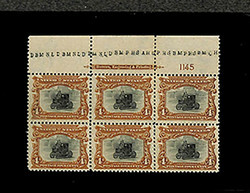 About (40) items, 296(2); 334; 370 plate of 12; 380; 402; 414; 437; 526; 527(2); 528 regular and monogram; 528A; 528B(3); 540; 551-6; 556 extra; 558(2); 559; 561-65; 571; 595; C5; K5; K13; Q5, a lovely group with some nice tops included, some never hinged, a few with the usual perf reinforcements but overall an above-the-bar holding of scarce desirable and most importantly saleable items, reviewing this will have you coming back for more, o.g., some never hinged / some hinged, generally Fine to Very Fine. Scott $25,000 Estimate $6,000 - 8,000.